How to track compensation and other job information changes in your employees' lifecycle. Compensation (pay rate and frequency, commission, bonus structure). If for some reason you would like to edit an existing employee record without adding a new record to their file, navigate to an employee's profile > the Job tab, and click on the three dots on the right side of their current record, then Make a correction from the dropdown that appears. In the modal view that opens, make any desired changes and click Save. There are three ways you can update and employees job information. To update an employee's record or schedule a change for some time in the future (e.g. 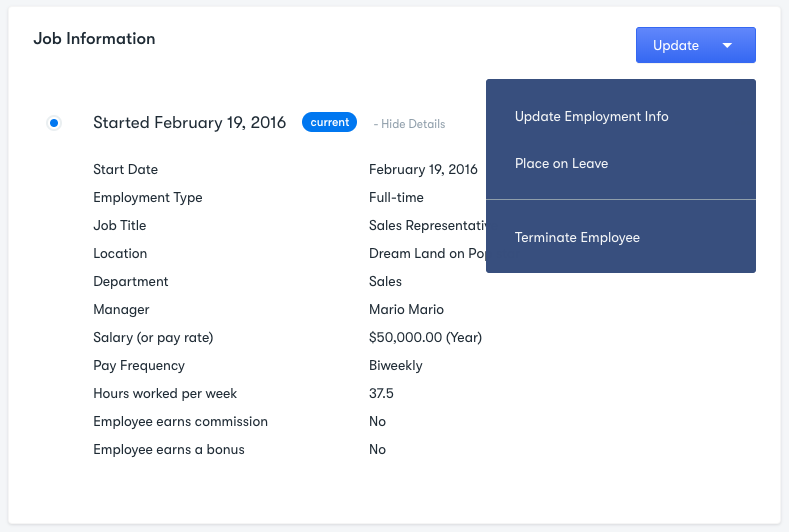 promotion), navigate to an employee's profile > the Job tab > click on the Update dropdown button on the right side, and choose Update Employment Info. In the modal view that opens, enter the desired changes and set the effective date to a day in the future. Click Save when you are done. The employee's job record will now show a scheduled change in the timeline that will automatically take effect on the selected date. Note: When adding or editing an employee record, use the Comment box at the bottom of the modal view to provide the reason for each change (not visible to employees). Similar to how you add a new record for a future date, you can also add a past record to an employee's job history by selecting a past date for the effective date instead. The historical job information you've specified will now show up as a point on the timeline below the current record. Note: An employee's oldest effective date will automatically be marked as their start date.